Urban agriculture is in the spotlight. Eating plenty of fruits and vegetables is key to a healthy diet, but not everyone has ready access to a grocery store, or can afford to buy fresh produce. Community and backyard gardens supplement the diets of low-income families with fresh fruit and vegetables. In Los Angeles, entrepreneurs are farming on high-rise rooftops, in controlled environments like greenhouses, and in vertical spaces to grow fresh food for high-end consumers and restaurants. Many California cities have developed local policies to promote urban agriculture. San Diego, for example, has made it easier for residents to keep chickens and bees in their backyards, and to establish farmers markets, produce stands, community gardens and small urban farms. Oakland updated its city code in 2014 to allow community gardens in most of the city without a special permit. The urban ag trend is getting the attention and support of UC Agriculture and Natural Resources (UC ANR). The division provided funds that allowed UC Cooperative Extension advisor Rachel Surls to lead a survey of urban farmers and agricultural scientists to develop a website with useful resources for California’s urban farmers. Surls started communicating with California’s urban farmers and others in the field with a comprehensive website, via Twitter (@UCUrbanAg) and Facebook. Surls is also coordinator of the Los Angeles County UCCE Master Gardener program. She hopes to turn some of the Master Gardeners’ attention to alleviating the problem of food waste. Surls was looking for adventure when she traveled to Honduras in 1985 as a Peace Corps volunteer. She she gained an experience that would shape her career at the intersection of agriculture and social awareness. With limited resources, Surls began an education routine that taught agricultural sustainability. “I provided seeds, and taught composting, basic pest management, and other skills to help them grow successful gardens. I had a demonstration garden at the health clinic in the middle of town, and encouraged people to visit, learn about the crops, and try some of the vegetables,” Surls said. This is a sustainable model she implemented when she returned stateside and took a position with UC Cooperative Extension (UCCE) in Los Angeles County as a school garden and community outreach coordinator in 1988. Surls helps create garden clubs, managed community gardens, and taught low-income residents how to supplement their diets by growing their own healthy foods. “I loved the work [and] I realized if I wanted a future in it, I needed more education,” Surls said. Surls earned a master's degree in agricultural sciences from the California Polytechnic State University, Pomona, while working full time for UCCE. 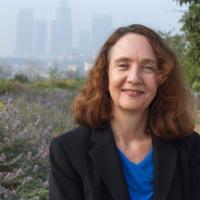 In 1994, she was appointed the urban horticulture advisor in Los Angeles County, working closely with community and school gardens, community agriculture and urban food production until she was promoted to county director in 1997. While directing Cooperative Extension, Surls continued her schooling, earning a Ph.D. at Claremont Graduate University higher education administration in 2008. Surls recalls “always [keeping] some involvement with community gardens and school garden activities during those years." After nearly 15 years in the administrative role, Surls was named the UCCE’s first sustainable food systems advisor in 2012. “There was a growing societal awareness of hunger and food inequities, and I wanted to do something about that,” Surls said. As she studied the urban food landscape in her new role, one need stood out – urban farming was becoming popular, and few research-based resources were available. 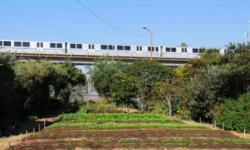 Growing vegetables in a train's shadow. Surls and co-author, LA Master Gardener and farm writer Judith Gerber, trace the rise and fall of Los Angeles farming in a book slated to be published in mid-2015 tentatively titled “From Cows to Concrete: How farming transformed Los Angeles." “All of the factors that made Los Angeles so amazing for farming made it a desirable place to live,” Surls explains. “Especially after World War II, farmland was paved over for buildings, freeways, homes and shopping districts. The county is now home to more than 10 million people.” These are the perfectly ripe conditions to start a new and sustainable, urban farming movement.